days, has died at an animal sanctuary in New York. to lose the use of her back legs. when a veterinarian arrived to examine her, Coston said. vet and dented her car, Coston said. the pasture, her cow buddies spent the night with her. protective of her," Coston said. who arrived to handle the sad task back to his tractor. half while foraging in Mount Storm Park. Charlie Luken pledged to give her a key to the city. unturned, milking the story for all it was worth. factory farms receive lifelong care. called her Cindy Woo, Coston said. 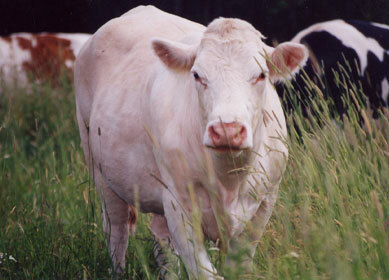 for a Charolais," Coston said. "She was a bit of a chunk," Coston said, laughing. an amazing thing to see," she said. countless visitors familiar with her story. "People from Ohio were always visiting," Bowman said. Coston thinks she understands why. be messed with," Coston said. "We can relate to that."